Femili PNG was established in 2014 in Lae as the first Case Management Centre in Papua New Guinea, and is supported through the Pacific Women program as part of the Papua New Guinea-Australia partnership. A local NGO, Femili PNG provides advocacy-based case management to assist survivors of family and sexual violence to access the services they need. This may include referrals and transport to health, police or other legal services; help with making a statement for the courts; case conferencing with other service providers to find solutions in high risk or complex cases; relocation or emergency support. In the first two years of operation between July 2014 and June 2016, Femili PNG provided case management services to 900 clients. Femili PNG has recently published two reports on the usage of the services they provide and client satisfaction from survivors of family and sexual violence in Lae. The first report draws on client data from its first two years of operations and shows that the bulk of client survivors of violence are female (93%) and that the main alleged perpetrators (95%) are either a family member, friend or neighbour and mostly male (88%). The client data also shows that survivors of violence come from across the socio-economic spectrum. The second report captures results of Femili PNG’s first client satisfaction survey. 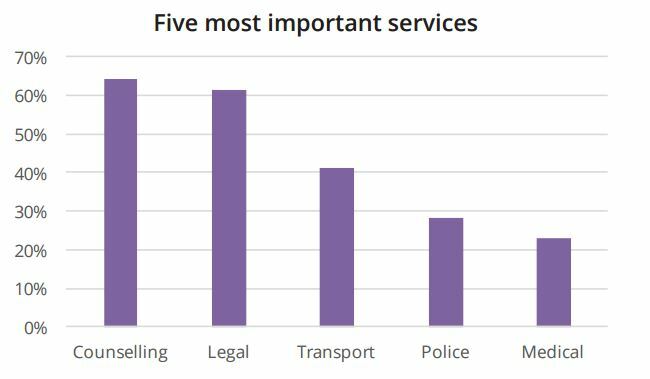 Randomly selected participants (n=39) whom took part in the survey had accessed services such as counselling and transport support to enable them to access other services such as police, medical or legal. While participants wished for fewer delays in obtaining services (13%), 95% of Femili PNG surveyed clients reported they were satisfied with the services they were supported to receive and 75% were satisfied generally with service provider partners.